Gallia Academy senior Obie Reeves (24) kicks the ball during the Blue Devils’ soccer match against Belpre on Tuesday in Centenary, Ohio. CENTENARY, Ohio — Unfortunately for the Blue Devils, Belpre began raining goals down upon them as the downpour picked up on Tuesday night. 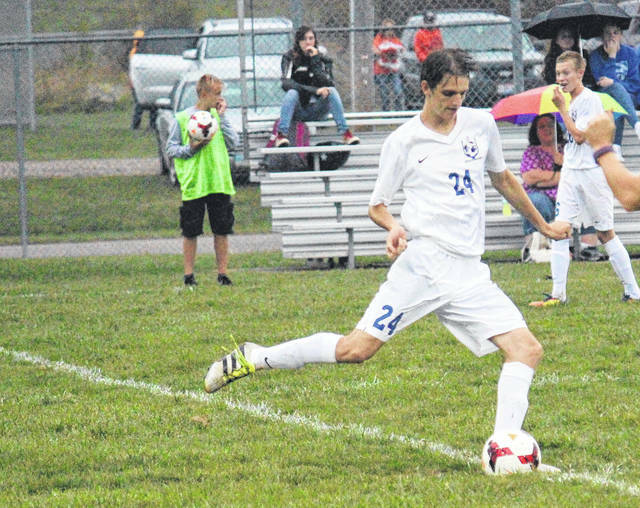 In another contest in which Gallia Academy allowed too many markers, the visiting Golden Eagles upended the host Blue Devils 5-2 in the 2017 regular-season soccer finale at Gallia Academy High School’s Lester Field. The Blue Devils did trail just 2-0 at halftime after a rough 10 early minutes, and even got to within one on an Andrew Toler long-range blast amid the hard second-half rainfall. But Gallia Academy only enjoyed that one-goal deficit for a mere 45 seconds, as the Golden Eagles — with 24 minutes and six seconds remaining — made it 3-1 on Wyatt Fields’ third goal for a hat trick. Just three minutes and 14 seconds later, and with the rain intensifying even more, Belpre booted in another goal for a 4-1 advantage, as Jordan Harrington hit the back of the net. The Golden Eagles’ final goal — by Kellar Windland — came with just 25 seconds to play, and occurred long after both teams had substituted liberally and emptied their benches. The Blue Devils’ Justin Day, with a tally with 6:50 left, made it 4-2 in favor of Belpre, but by then it was too little too late on the slippery natural grass surface. With the win, Belpre raised its record to above .500 at 8-7, while Gallia Academy —with only three seniors for Senior Night on Tuesday — ended its regular campaign at 1-11-4. And, in those 11 setbacks, the young Blue Devils were outscored by a whopping count of 58-7. That’s despite the impressive goalkeeping by senior Pierce Wilcoxon, who took over in net early in the season and did his best to keep the orb out of the strings. Wilcoxon was honored along with the other two seniors — Tristan Eggers and Obie Reeves. Eggers and Reeves played sparingly for the Blue Devils, but did see many more minutes on Senior Night. Wilcoxon, however, did not play in the second half after a late first-half collision with Belpre’s Fields. With a minute and 43 seconds showing, and right in front of the goal, Fields and Wilcoxon went down hard after battling for a free ball and colliding — with Wilcoxon exiting with a sore back. He played for the final 1:28 of the opening half, but decided not to go in the second half and Kaylie Clark checked in. Camden said the sudden change shifted some momentum that he felt the Blue Devils did gain. “Losing Pierce tonight turned the tide on us in the second half,” he said. Both GAHS goalkeepers made one save apiece as Belpre took 11 shots, but the Blue Devils — despite only four shots on goal — did find some offensive possession after falling behind 2-0 in the opening 10 minutes. However, they had nothing to show for it — until Toler’s right-footed rocket with 24:51 remaining. Still, they fell behind early before the rain began to fall, as Fields scored his first two goals just two minutes and 20 seconds in — and later at the 30:11 mark. Day had two shots for the Blue Devils, as freshman Anthony Borden attempted the other. Belpre keeper Brady Clem chalked up two saves, as Gallia Academy blanked Belpre in corner kicks 4-0. The Blue Devils, after the rest of this week off, will travel to face Fairland for a Division II sectional semifinal match on Monday at 5 p.m.
Gallia Academy is the ninth seed in the sectional while Fairland is the eighth seed, as nothing was settled in the regular season between the two —thanks to a 2-2 tie in the season opener and a 1-1 draw a month later. Only this time, because it is a tournament match, there will be a winner which will play top-seeded Alexander for the sectional championship. Camden explained that he believes his Blue Devils did get a favorable foe — as well as a familiar one. Both schools are members of the Ohio Valley Conference.